After winning 12 of 19 from the Marlins last season, the Mets look to keep that trend going while also trying to take the first series with fish this year. The Mets took the 1-0 lead in the first after they loaded the bases for the buffalo Wilson Ramos. Dom Smith then followed with an opposite field single for an R.B.I. of his own. Rosario followed with a two run double down the left field line, putting the Mets up 4-0 with just one out in the first. Lagares then grounded to second baseman Starling Castro but surprisingly he went home for the out and didn’t succeed as Smith scored the 5th run of the inning. After the Marlins got one back in the bottom half of the first, the Mets put runners on second and third with two outs and Dom Smith up to bat. Ureña threw a bad door slider to get Smith to go down swinging and end the inning. After Vargas got Brian Anderson to fly out to Conforto, Castro and Prada followed with back to back singles for Marlins catcher Jorge Alfaro. However, Alfaro hit a tailor made 6-4-3 double play to put an end the inning. Starling Castro would get one back for the fish by hitting a solo home run off of Vargas in the fifth, Prado followed with a hard hit two out double to left field. Vargas would get out of another jam by getting Alfaro to break his bat on a weakly hit ground out to Cano. Wilson and Smith lead the seventh off each with a single, after loading the bases with two out for Brandon Nimmo. In an odd turn of events, Nimmo would take an inside fastball on the knuckles which would drive in an insurance run, making it 6-2, Mets. The Marlins scored 2 runs off of Lugo in the seventh, keeping them in striking distance. Lugo then loaded the bases for the Marlins in the eighth before Callaway removed him for lefty Justin Wilson, with just one out in the inning. Wilson would get JT Riddle to ground out to first, cutting the lead to one. However, Wilson would keep the fish at bay when he struck out Jorge Alfaro with a nasty cutter to end the inning. 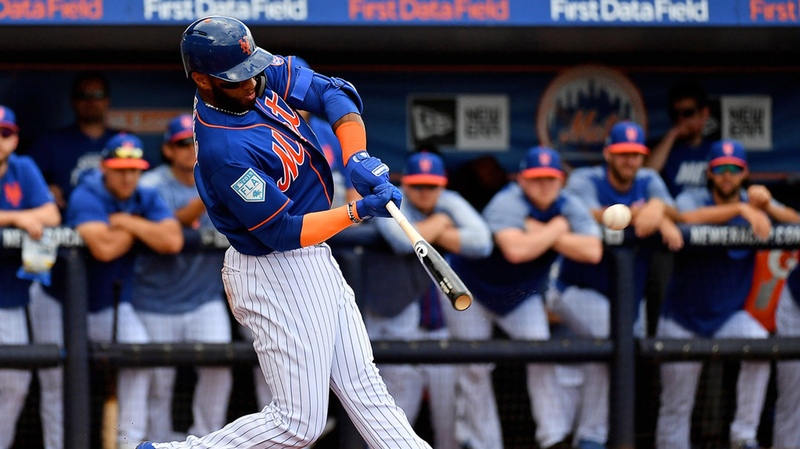 With the Mets up 6-5 in the bottom part of the ninth inning, Callaway would opt for Wilson to remain in the game, instead of going to former closer Juerys Familia. He lead the inning off to hit the speedy Brinson to lead the inning off, then pinch hitter Chad Wallach would single to put the tying run at second base. Wilson however would get Miguel Rojas to line into a double play to end the game. Vargas went five innings, giving up eight hits, two runs, striking out two and walking one. The Mets bullpen combined going 4.0 innings, giving up 8 hits, 1 walks, and 3 runs. Justin Wilson would pick up his first save of the season.